What’s instructional about this is that Trump is smart enough (like Huckabee in a previous post) to know that the whole “birther” argument has been resoundingly debunked. Like Trump, and the people leading the aforementioned billboard campaign, its not that these smart people believe it either. Rather, they are purposely stoking up the lesser informed citizens. In other words, they are deceiving people. During an interview with Trump earlier last week, O’Reilly called The Donald’s rhetoric a publicity stunt to capitalize on the views of birthers who believe Obama wasn’t born in the United States. 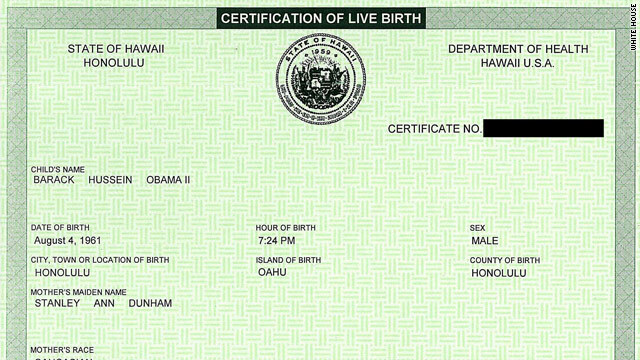 If President Obama’s certification of live birth wasn’t legitimate, the Republican party would have been all over it years ago. The RNC has an army of lawyers and media experts, and they would have completely blown President Obama out of the water during the 2008 campaign. Senator McCain would have much rather had that in his quiver than his lame attacks on Ayers. If you have to have more, an image of President Obama’ s Certification of Live Birth is provided at right. You can also visit the links below for definitive smashing of the birther argument. Snopes: It is not a forgery. People who are really interested productive work on a better future need to bear in mind that the people who are perpetuating this myth are purposely peddling fear and myth. They are trying to manipulate people and that weakens the democratic process.